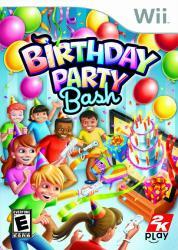 Up to 12 partygoers can whack, roll, splash, pop, and shimmy their way through over 20 birthday games, including twists on classic favorites like Pi�ata Blast, Duncan Hines Cake Stacker, and Birthday Blowout. Ten party theme rooms set the scene for an unforgettable bash, from �Pirates� to �Princess�. When it�s cake time, everyone can sing along to �Happy Birthday.� Free party invitations included in the box! Up to 12 players can play via 4 player turn-based play.